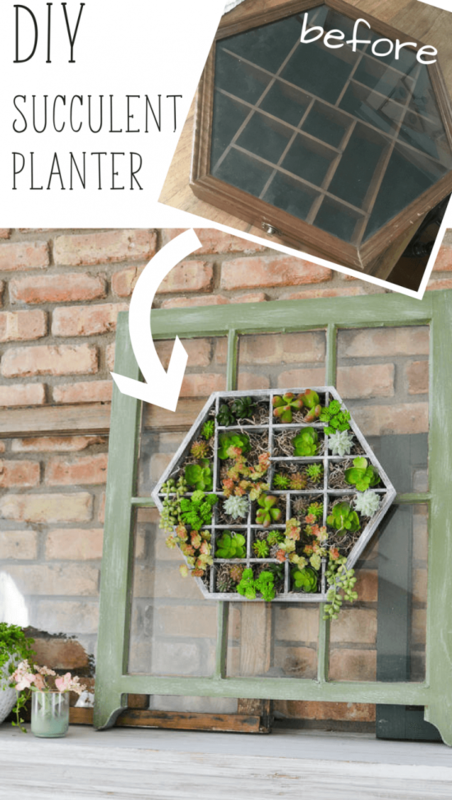 This DIY succulent planter was created using an old trinket display case found at the thrift store. 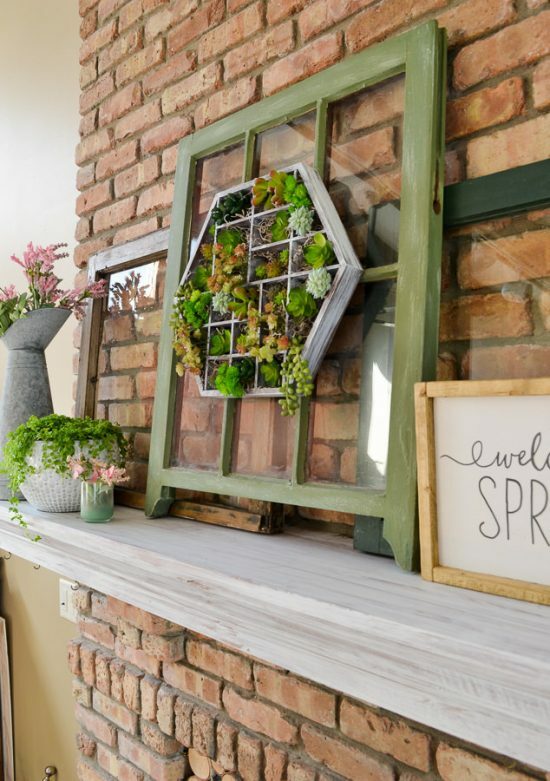 With a little paint and some faux succulents, it’s a planter that can be hung on the wall year after year. 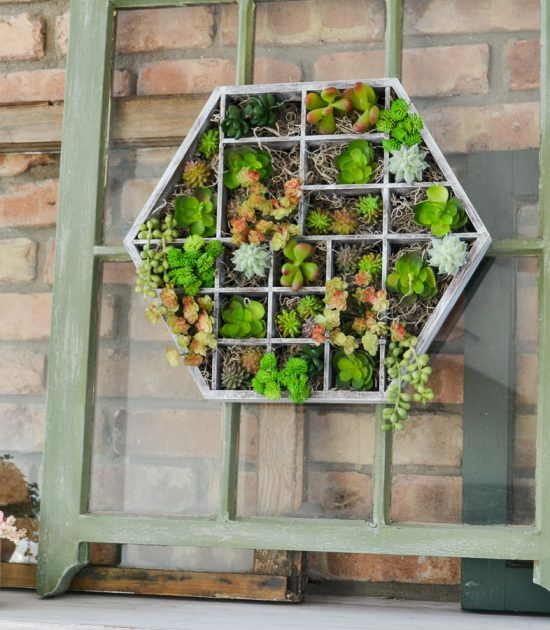 A wooden toy crate, like those from Melissa and Doug, could be painted and used to create a this succulent wall hanging, too! I stumbled upon this wooden trinket case at Goodwill a couple of months ago. 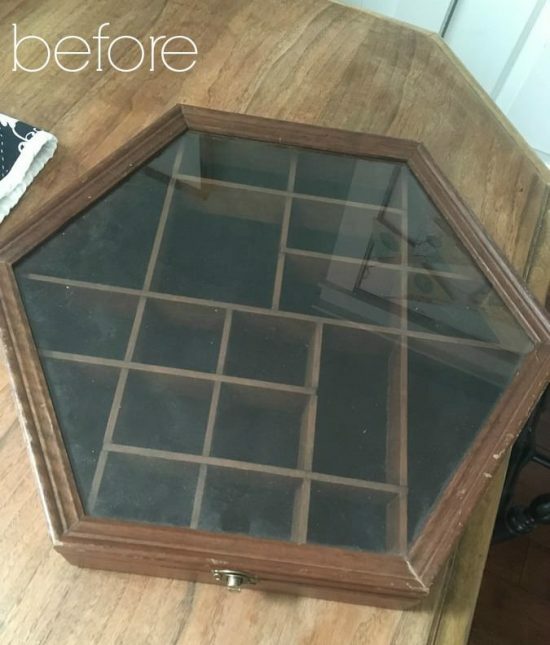 Originally, I just planned to take off the glass frame and make it into a mirror, but after looking at the wooden crate with all the little compartments, I knew I could reuse that part of the piece as well. 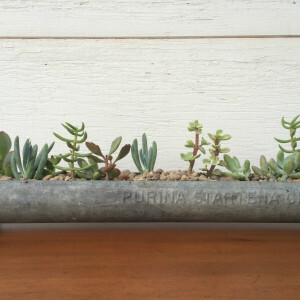 I’m a big fan of succulents, and I love planting them in unusual places. The quirky look of them combined with a vintage vessel just makes me smile. 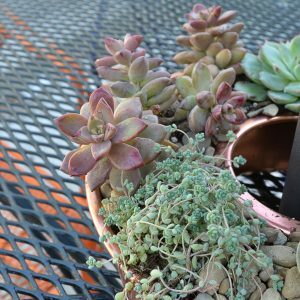 In fact, I’m such a fan of succulents, I devoted an entire post to how to plant succulents so they don’t die. Okay, so it’s clear that I love succulents, but I’ll admit, I’ve only used real succulents in my home. Because I plan to keep this succulent planter out only during the spring and summer, and then put it in storage during the fall and winter, I knew I couldn’t use real succulents. Those little guys wouldn’t stand a chance at surviving for half of the year in the uninsulated garage during our northern Illinois winters. Although I’d much rather prefer real plants over fake, I decided to go the faux route for this planter. 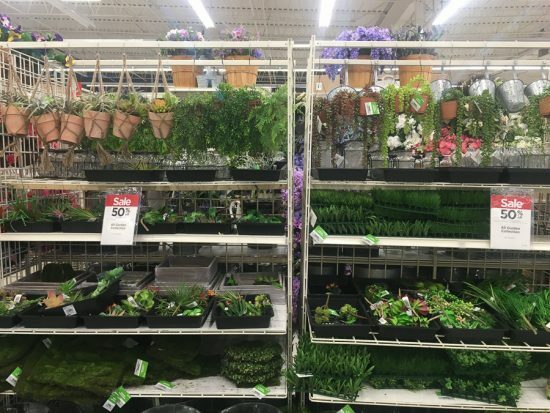 Thankfully, I was very surprised at the selection available, and how real they actually looked, when I went shopping at Michaels. Fake plants have come a long way since the time when my grandma used to decorate with them! 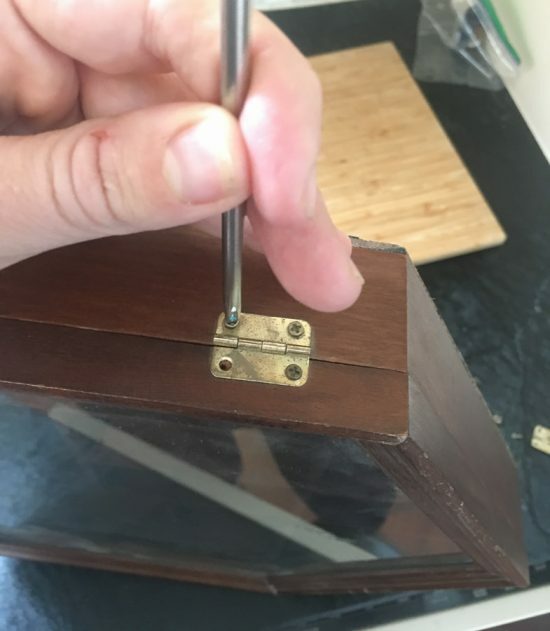 To start, I unscrewed the top glass frame from the bottom box and removed the hinges. You could choose to fill the holes with wood filler (I didn’t, but I’m a tad bit lazy when it comes to details), and then just paint it in the color of your choice. I used a dry brush technique (dip your brush into a tiny bit of paint, wipe off most of the paint with a towel, and then quickly move your brush back and forth over the surface) to lightly paint mine, but if I wanted to go for a solid color, I definitely would have used spray paint. It’s the easiest and fastest way to paint in all those little compartments! 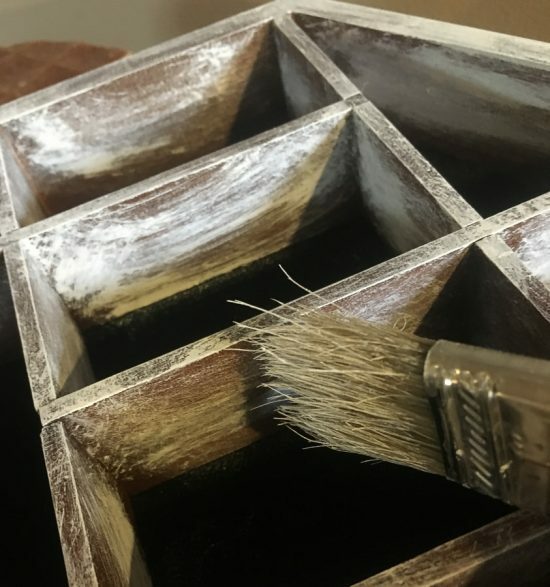 After it dried (dry brushing paint dries super fast – within minutes! ), I glued some spanish moss into each compartment using hot glue. On top of that, I added succulents and glued them into each area with hot glue as well. My trinket display case already had picture framing hooks on the back to hang it, but if you were using a reused toy crate, just nail in a sawtooth picture frame bracket. 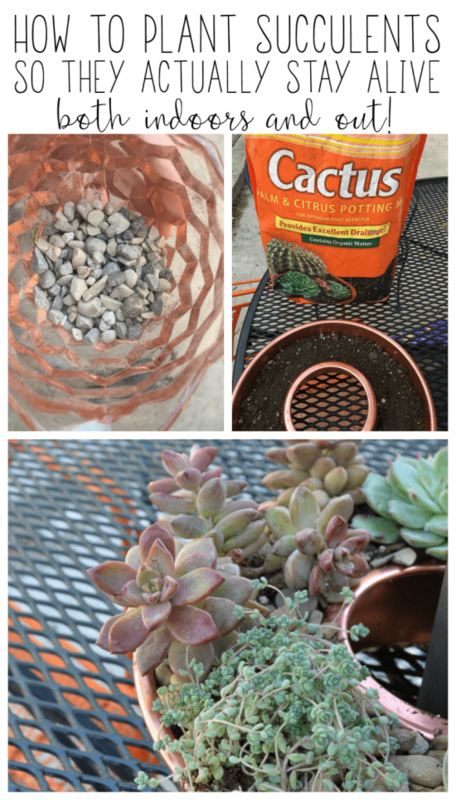 This hanging succulent planter was so easy to make, and adds the color and interesting look of real succulents, without the hassle! What an amazing find! You have great vision for creating a planter out of this box. I like succulents also. You did a great job creating this from the display case. It adds nice color and texture to the mantel. Hi! 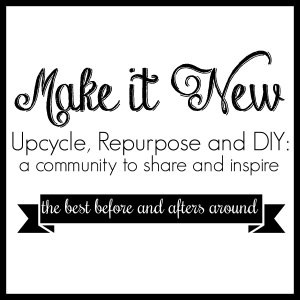 Visiting from the Remodelaholics Linkup! This is such a creative project! Love how it turned out! 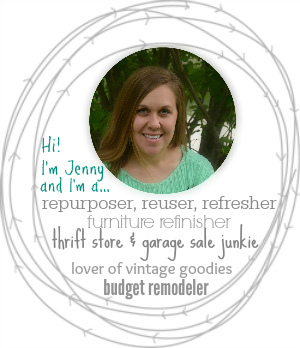 Jenny I love your succulent planter and will be featuring it on this weeks OVER THE MOON LINK PARTY which goes live on Sunday evening, 6 pm Eastern. Thanks for linking up and join us again this Sunday. What a great idea. I’ll be looking for a display box on my flea market/yard sale excursions this summer. It looks great! Thanks for sharing on Sunday’s Best. Hi Jenny! 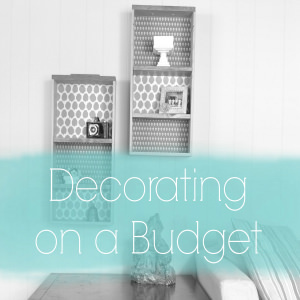 This is such a great project, and I have featured you today at Thursday Favorite Things. I hope you will come over and link up some more great ideas! Thanks for partying at TFT! 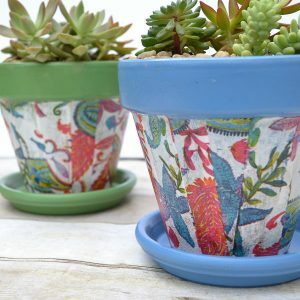 Hi Jenny, I love your planter and I’ve featured you on this week’s Party in Your PJ’s! I’ve shared on all social media too! Thanks so much for sharing, Teresa!